2007년 9월 어느날, 한 프랑스 철학자와 그의 아내가 세상을 떠났다. 두사람이 누운 침대 곁에는 "화장한 재를 둘이 함께 가꾼 집 마당에 뿌려달라"는 편지가 남아있었다. 그 프랑스 철학자의 이름은 앙드레 고르. 그의 부인은 도린 케어. 둘의 부고는 유럽을 비롯한 전 세계인의 심금을 울렸다. 고르는 유럽의 대표적인 언론인이자 철학자다. 렉스프레스지 기자를 거쳐 누벨 옵세르바퇴르지를 공동 창간했고, 스승이자 친구였던 장 폴 사르트르가 별세한 뒤 그가 창간한 레탕 모데른지를 이어받았다. 사르트르가 "유럽에서 가장 날카로운 지성"이라고 평가한 신마르크스주의 사상가이자 녹색정치의 창시자였다. 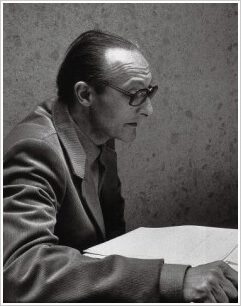 One day in September 2007, a French philosopher and his wife died. Two men lying beside the bed, "cremated ashes scattered in your yard planted with two different," said the letter remained. 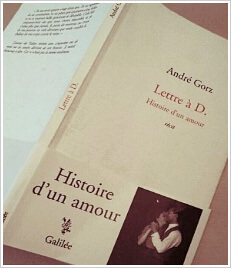 The name of the French philosopher Andre Gorz. Care of his wife, Dorien. Obituaries of both the heartstrings of people around the world, including Europe rang. Europe's leading journalist and philosopher Andre Gorz. Being a reporter through presentations opsereubatoereujireul Rex Nouvel was co-founded, with Jean-Paul Sartre was a mentor and a friend after byeolsehan whether he took over that launched another retang Modesto. Sartre is "the sharpest minds in Europe as" Le Shin evaluated the size of Holland, was the thinker and the founder of Green politics. 이 책은 84세의 남편이 스무 해 넘게 불치병과 싸운 83세의 아내에게 보낸 연애 편지다. 고르는 1983년 아내 도린이 척추수술 후유증으로 거미막염이라는 불치병에 걸리자 모든 사회활동을 접고 간병에만 매달린다. 고르는 아내의 죽음이 가까워오자 그들의 사랑을 글로 남기기 시작한다. 'D에게 보낸 편지-어느 사랑의 역사'는 이렇게 탄생되었고 2007년 11월에는 국내에서 출판되어 큰 반향을 일으켰다. 이 책에서 고르는 "우리는 둘 다 한 사람이 죽고 나서 혼자 남아 살아가는 일이 없기를 바란다"는 고백으로 끝맺음하였다. 그 1년 뒤인 2007년 9월 22일, 부부는 소도시 보농에서 극약을 주사해 함께 목숨을 끊었다. 유언에 따라 화장한 재는 부부가 말년을 보낸 뜰에 뿌려졌다. This book more than 84-year-old husband twenty year battle with terminal illness dating 83-year-old sent an open letter to his wife. Gorz 1983 as a spider his wife were lounging uveitis complications of spinal surgery terminally geolrija care only cling to fold all social activities. His wife's death came close to Gorz their love write this to start . D sent the letter - which the history of love' was thus born in November 2007 has been published in Korea caused a big impact. In this book, pick "a man we both died and I hope never to be left alone to live" was the conclusion of the confession. That one year later, on Sept. 22, 2007, the couple lives together Give her towns broke bonongeseo poison. Cremated ashes will, according to the court, the couple spent the last years of his life were sown. 책은 어느 부분을 읽어도 가슴이 찡하다. 고르는 글을 써야하는 심정을 이렇게 밝혔다. "우리가 함께 한 역사를 돌이켜보면서, 나는 많이 울었습니다. 나는 죽기 전에 이 일을 해야했어요. 우리 두 사람의 삶에서 가장 중요한 부분이 우리의 관계였기 때문입니다. 나는 이 글을 대중들을 위해서 쓰지 않았습니다. 오로지 아내만을 위해 이 글을 썼습니다." 여든세 살의 철학자가 여든두 살의 아내에게 바친 편지는 그들의 부고 이후 프랑스와 독일에서 최고 베스트셀러가 됐다. 책에 드러나는 한 지성의 아내에 대한 사랑은 눈물겹다. "밤이 되면 가끔 텅 빈 길에서, 황량한 풍경 속에서, 관을 따라 걷고 있는 한 남자의 실루엣을 봅니다. 내가 그 남자입니다. 관 속에 누워 떠나는 것은 당신입니다. 당신을 화장하는 곳에 나는 가고 싶지 않습니다. 당신의 재가 든 납골함을 받아들지 않을 겁니다. 캐슬린 페리어의 노랫소리가 들려옵니다. '세상은 텅 비었고 나는 더 살지 않으려네' 그러나 나는 잠에서 깨어납니다. 당신의 숨소리를 살피고, 손으로 당신을 쓰다듬어 봅니다. 우리는 둘 다, 한 사람이 죽고 나서 혼자 남아 살아가는 일이 없기를 바랍니다. 우리는 서로 이런 말을 했지요. 혹시라도 다음 생이 있다면, 그때도 둘이 함께하자고." 자기 품에 안긴 그녀의 희고 매끄럽고 따뜻한 몸을 그는 오래도록 바라봤다. 말 없이, 숨을 멈추고, 찬탄에 차서. Can not read any part of the book jjinghada chest. Feelings so that I'll be working to pick said. "Together we as a historical retrospect, I cried a lot. I had to do this before you die. Our two most important part of people's lives is precisely because of our relationship, I did not write this article for the masses . only wrote it for his wife only. 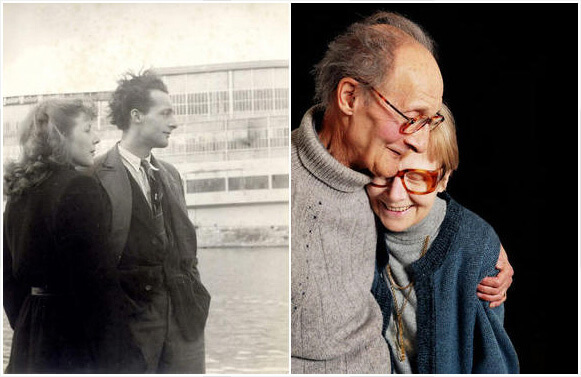 Eighty-two eighty-three-year-old-year-old philosopher who gave the letter to his wife after their obituaries bestseller in France and Germany were the best. Book revealed a love for his wife nunmulgyeopda of intelligence. "At night, sometimes an empty road, in the bleak landscape, walking along the tube to view the silhouette of a man I he is to leave you lying in the coffin is where you make - I do not want to go. urns the ashes of all that you're not gonna take. Kathleen ferrierite are as mad as the song of 'the world is empty and I live more aneuryeone' But I will wake up your breathing, look and hand you try stroking. We are both, after the death of a person living alone, hope it remains. We each had to say this. If you have any chance in the next life, then let's also a mix of both." Her arms, her white, smooth and warm the body, he looked a long time. Without a word, stop breathing, filled with admiration. 1947년, 스위스의 로잔. 돈도 없고 나라도 없는 오스트리아 출신 유대인 앙드레 고르의 인생에 영국 여자 도린 케어가 총총히 뛰어들었다. 두 사람은 우연한 만났으나 고르는 도린에게 첫 눈에 반했다. 이주에 이주를 거듭하며 불안한 삶을 계속했던 고르와 불행한 어린 시절을 보내며 늘 사랑이 결핍된 채 지냈던 도린은 급속도로 가까워지고, 스물넷과 스물셋의 나이에 결혼하게 된다. 어머니가 떠나버린 상태의 계부 아래서 사랑을 받지 못하며 자란 영국 출신 도린은 훗날 프랑스 국적을 얻고 '누벨 옵세르바퇴르' 를 창간한 지성인이기도 하다. 사교적이고 늘 밝은 표정이었던 도린은 늘 삶이 불안했던 고르가 최상의 저술활동을 할 수 있도록 뒤에서 그가 하는 모든일을 도우며 살았다. 1983년 도린이 '거미 막염'이라는 치명적인 병을 얻게되자 고르는 자신의 모든 활동을 접는다. 고르는 도린을 위해 파리를 떠나 보농이라는 시골에서 20여년을 아내 도린을 간호하며 지낸다. 고르는 '아내 도린이 없으면 다른 모든 것은 무의미하고 무가치하다'고 보았고 보농에서의 '검소한살림, 유기농으로 자급자족, 여유로운 시간 갖기, 나무 가꾸기, 진솔하게 대화하기, 저술활동, 친교활동, 등 그들이 이론적으로 추구했던 '완전한 삶'을 이루었다. 1947년 첫 만남 이후 남루한 셋방에서 처음으로 밤을 지샌뒤 지난 9월 프랑스 시골마을에서 생을 마감하기까지, 꼭 60년 동안 그들은 한 쌍의 원앙새처럼 정답게 살았다. 1947, in Lausanne, Switzerland. Austrian-born Jew with no money and no country, pick Andre Dorien care for British woman in your life plunged in haste. Two men met by chance, but falling in love at first sight dorinege pick. Again in two weeks to two weeks and continues to live insecure and unhappy childhood spent Gorz who always loved and spent less than deficient dorineun rapidly approaching, twenty-four and will be married at the age of twenty-three. Stepfather of his mother left him under the state do not receive love from the UK grew dorineun later gained French nationality 'Nouvelle opsereubatoereu' is also an intelligent person that launched. Was always sociable and cheerful look dorineun always been troubled life of the author of the best activities to Gorz to be helping behind the scenes he lived every day. 1983 were lounging 'spider meningitis "when you get to pick a fatal disease and fold all of their activities. Gorz to leave Paris for dorineul bonongyiraneun care in rural areas and spends more than 20 years dorineul wife. Pick 'If my wife were lounging everything else is meaningless and worthless' and saw the bonongeseoui' frugal hansalrim, organic self-sufficiency, have a leisurely hour, wooden gardening, to talk honestly, writing activities, and fellowship activities, etc. In theory, they sought 'perfect life' has been made. just 60 years they lived some love like a pair of Mandarin.